Thermal transfer is a key element of efficient anaerobic digestion (AD) plants. 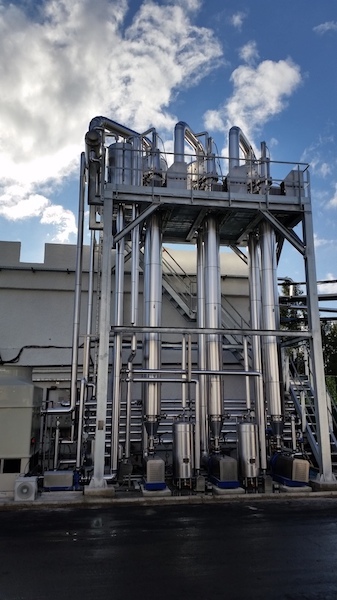 Whether pre-treating or pre-heating feedstocks, improving process efficiency, or treating digestate to pasteurize it or reduce its volume, an increasing number of AD plant designers and operators are using heat exchangers to boost their thermal processing requirements. Even with a variety of applications possible, it is important to select the right heat exchanger for each individual requirement. There are a number of heat exchanger types on the market: plate, tubular, corrugated tube, scraped-surface, etc. Each is suited to a particular application. Considerations include the nature of the materials to be heated or cooled; the objective of the process, such as pre-heating or pasteurization; and any restrictions of the environment where the heat exchanger is used. The driving force for heat transfer is the difference in temperature between the two substances. In the case of a smooth tubular heat exchanger, the temperature of two simple fluids changes as they pass through the heat exchanger. One of the reasons for making corrugated tube and scraped-surface heat exchangers is that they are suitable for fluids and materials with complex properties—such as viscous and non-Newtonian fluids—or for materials containing particles or sediment. It is important to be mindful of the material to be processed before selecting a heat exchanger. It also is a good idea to seek professional advice from manufacturers and their agents during the selection process. Once the correct type of exchanger has been chosen, developers and operators must make sure the model supplied is correctly sized for the job. The heat exchanger must have a large enough heat transfer area for the specified fluids and their specified inlet and outlet temperatures. Most calculations also should factor in variables such as whether the heat exchanger uses counter-flow or parallel flow. Facilities that use anaerobic digestion have been using heat exchangers to improve process efficiency, treat digestate, and pre-treat or pre-heat feedstock. The values for numbers 2 and 4 may be supplied by the client based on experience, while the designer of the heat exchanger will select the tube size, thickness and materials to suit the application. The resistance to heat flow resulting from numbers 1 and 5—known as the partial heat transfer coefficients—depends on the nature of the fluids and the geometry of the heat transfer surfaces themselves. One way to prevent the buildup of these layers is to increase the speed at which the fluid passes through the heat exchanger so turbulence is formed and the boundary layer breaks away from the surface of the tube. This is the point at which so-called laminar flow becomes turbulent flow. The speed at which this occurs is influenced by many different factors, but in order to quantify it for the purpose of specifying heat exchangers, engineers use something called the Reynolds number, or Re. This is determined by the diameter of the tube, the mass velocity of the fluid, and the fluid’s viscosity. Reynolds numbers of less than 2,100 describe laminar flows. Numbers above 10,000 describe full turbulent flow. Between the two values is an area of uncertainty called the transitional zone, where it is common to see a general transition from full laminar to full turbulent flow. Engineers try to provide solutions outside of this zone as much as possible. Tube deformation, such as corrugation, helps to increase the heat transfer performance once the fluid has entered the turbulent flow area (Re > 2,100). This is the main reason for using corrugated tube heat exchangers. While scientific research on scraped-surface heat exchangers is lacking, companies like HRS Heat Exchangers are seeking ways to research their performance. The mathematics and understanding of thermodynamics is continuing to evolve and improve. However, much of the literature commonly used to build calculations and model heat exchanger performance can be up to 80 years old and does not always reflect recent science. While there is scientific literature for the behavior of fluids in smooth and corrugated tubes, there is little published data on scraped-surface heat exchangers.